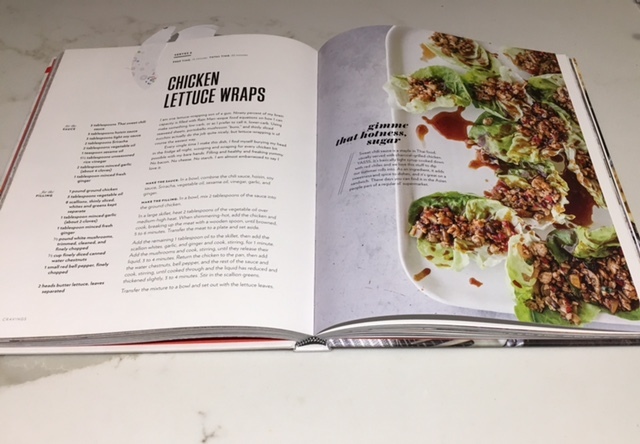 My cooking adventures continue this week with another recipe from the Cravings cookbook, Chicken Lettuce Wraps. I have always been a huge fan of chicken lettuce wraps. I used to go to P.F. Changs just for their lettuce wraps. When I saw the recipe in the Cravings cookbook, it was definitely on my list to make. I was going to Whole Foods, so I knew I would be able to get ground chicken (which I can't seem to find anywhere else). I picked up all of the ingredients and thought it would be pretty easy. The total time says 30 minutes, so I knew I could easily put it together for a weeknight meal. WRONG. Either Chrissy uses a food processor, is a super fast chopper, or it is bs because it took me A LOT longer. You have to chop scallions (both the green and white part), 1/2 pounds of white mushrooms, 1/2 cup of water chestnuts, 1 red bell pepper and 1 tablespoon of ginger. The mushrooms took forever since everything has to be minced. Chopping would have been fine, but mincing everything takes so much longer. Once everything was prepped, I made the sauce and cleaned the butter lettuce. I browned the ground chicken and removed it to start cooking everything else. This is when it got messy. You heat the oil, then add in your scallion whites, garlic and ginger. So much splatter from the oil (and yes I used the proper oil per the recipe). I continued by adding in the mushrooms and cooking for a few minutes. Next, add back in your cooked chicken, water chestnuts, bell pepper and sauce. By this time, I was mad that not only did the mincing take forever, but my kitchen was covered in oil (the subway tile back splash, the stove top, the floor, counter top near the burner and one cabinet). I told Rory this better taste awful because I never want to make this again. After everything was done cooking, I added in the green scallions and we served the ourselves. It was time to taste them....and they were heavenly. Seriously soooo good. Even though they were more trouble than the recipe states, I still want to make them again with these few changes. I will use a food processor to mince everything and I will either cook it in a stockpot or with a grease screen on top. I had to clean part of my kitchen after which included moping the floors at 8 pm which is never fun. I survived another week. Too bad I have to work all day since we had Monday off for President's Day. But I am out of the office next week and exploring more of America. I.CAN'T.WAIT. We don't have a lot on the agenda this weekend as we have another weekend of snow. Yep. The west coast keeps getting pounded with snow. I am so over winter already. Have I mentioned that? ONE. 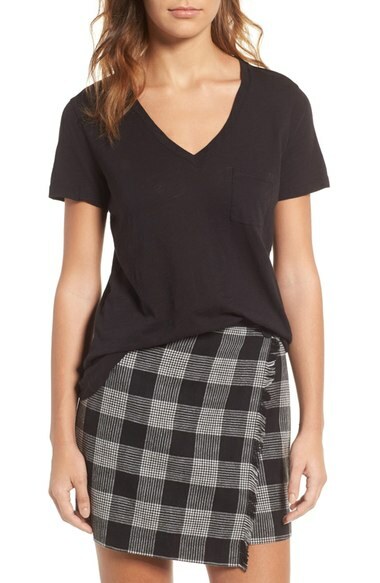 So I am looking for basic tees that are soft and amazing. Something that holds up would be nice since the ones I used to get from J Crew would get holes in them after a few washes. I blame the thin material. But I have been searching all week for the best soft tees. So far I have had my eye on this one. It's from Madwell and gets good reviews on Nordstrom. What is your favorite tee? TWO. Bathing suits. Another thing that I need is more bikini tops. I only have two that fit and I went to my tried and true, Victoria Secret and nothing. There are a few on VS Pink, but then I remembered when Lindsay mentioned that VS was going to stop selling bathing suits. Did that really happen? Ugh. So annoyed. I have bought 95% of my bathing suits from there and have no idea where else to shop. Suggestions? 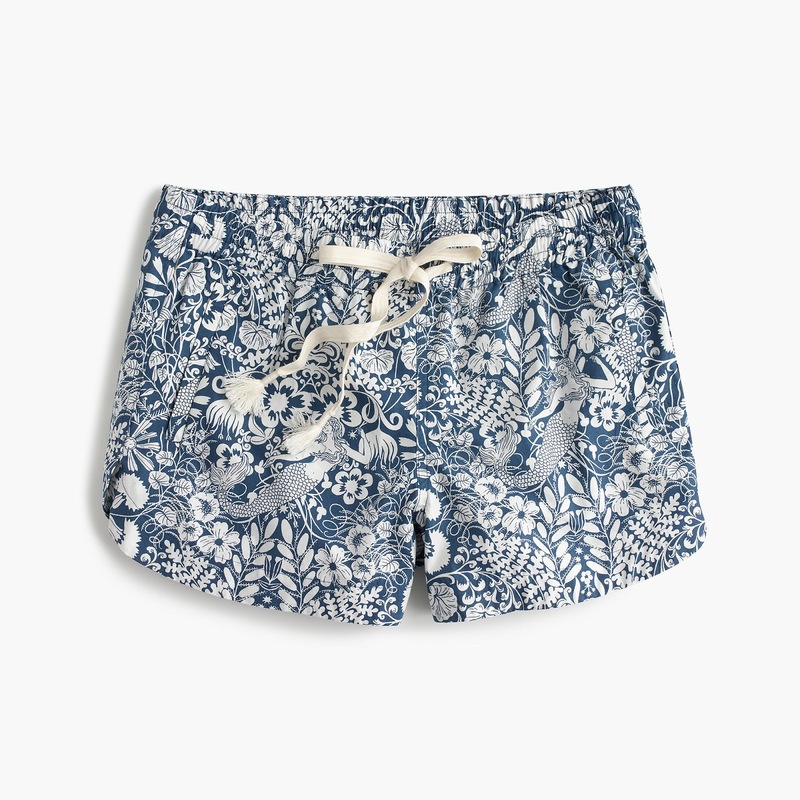 I still need suggestions, but I found a really cute bathing suit at J Crew and Nordstrom. It is a high cut halter top, but I think it is so cute. Plus it will replace my blue and white stripped suit that I loved from Garage (I bought it at the Mall of America a few years back). THREE. Happy Anniversary to my parents. On Sunday, my parents will be married for 34 years. I am 33, turning 34 in August. You do the math :) Love you mom and dad! But seriously. I can't believe they have been married for that long and together for longer. They are my relationship inspiration. 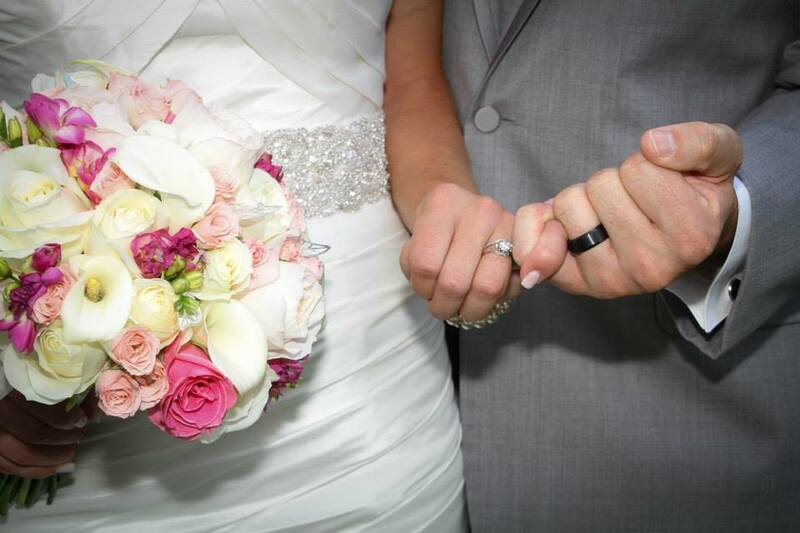 Rory and I will celebrate 4 years of marriage in August and both sets of parents have been together forever. So cool to be a part of this. FOUR. I bought Big Little Lies after so many bloggers raved about it. Plus it just came out as a series on HBO and I am dying to see it. So hopefully I can read the whole thing next week on my work trip. And I need more suggestions for my Mexico trip as I usually can get through two or three books. So send your recommendations please. FIVE. If you haven't watched This Is Us this week, stop what you are doing and watch it. And don't look below this. Skip to the bottom. I seriously LOVE this show and this weeks episode really confirmed that. I haven't cried that hard in so long. I was a sobbing mess. This nailed it for me. Another Thursday, another round of confessions. / that every evening when we pick the girls up from daycare, they are soooo happy to see us until we go to put them in their car seats. Then they turn into crazy people and scream, cry and kick. We have to let them freak out for awhile and get all the looks from them crying until the girl settle down into their seats. I am soooo over this. Another reason we NEED to get them into daycare close to where we live. / that I am totally over this weather. I know I say it a lot, but I am soooo jealous of everyone's 70 and 80 degree weather. My mountain (ski resort I go to) has over 600 inches. This is a record breaking year. I love that part, but I hate commuting in it and just being in it. I need sunshine. Winter please leave. / that even though I have a huge crack in my windshield, I haven't gotten it repaired due to the weather. Another reason it needs to go away. Mama needs a new windshield. Don't worry, it isn't in my direct line of vision, but it is bad enough that it needs to be replaced soon-ish. / that I can't stop eating candy. Ugh, Why did my kids get so much goodies for Valentine's Day? Can't stop, need to stop. / that since I started running again, I feel ok when I have another piece of candy because running is burning it off, right? But I am sure my dentist won't be too pleased about it. / that I was a little worried when one of the people I am meeting in Mississippi told me that I needed to change my hotel to the surrounding suburb because the one I was in, is pretty dangerous at night. They all carry guns to work and said that I need to be super careful. Ugh. I changed my hotel in seconds. I hit up Old Navy last weekend and I feel like I bought out the whole store. 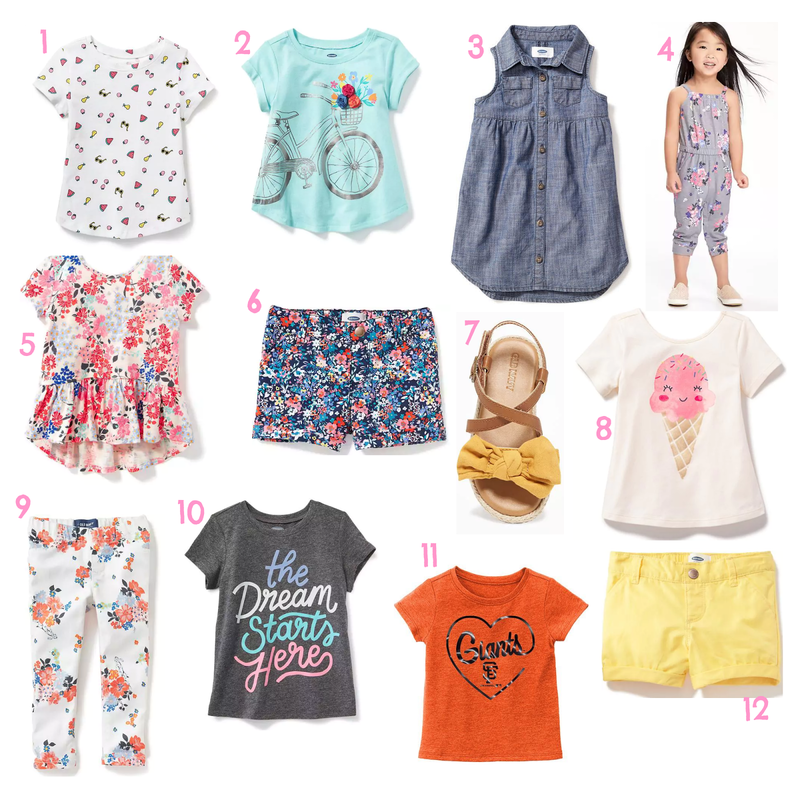 The girls needed a bunch of clothes for Mexico plus Spring and Summer, if they ever get to Nevada, so I went to Old Navy and found so many things. These either made it in my shopping cart or we are on the search for them. Seriously such cute stuff. And I can't complain when I use my Old Navy cash plus the discounts already offered in stores. 23 days and counting until Mexico! This weekend flew by in an instant and we didn't even do that much. And that was so nice. I needed a weekend of recharging and that is just what we got. This weekend was full of rain and snow. The mountains got so much snow. 42 inches last night alone. Nevada is definitely out of its drought. Friday morning, I had the most delicious donut at work. It was the best way to start the day. After work, Rory and I headed out to lunch and then to Costco for diapers. By the time we were finished with that, we grabbed a quick coffee and headed to the girls' daycare to pick them up. Just as we got home, my parents arrived to watch the girls for us. Rory and I went to look at a daycare for the girls. We toured for about an hour and were very impressed. After the tour, we stopped at the store to pick up essentials for breakfast Saturday morning. Then we headed home for a bit. We went to dinner with my parents at this amazing Chinese/Taiwanese place. The girls had so much fun eating off of their grandparents plates. After dinner, we headed home to burn some energy off and then put the girls to bed. We tried watching Parenthood, but our internet was slow due to the storm rolling in. Saturday morning I attempted to make waffles. I used the pancake mix that we love (it is also meant to be used for waffles). The problem with the first batch was I didn't whip my egg whites until they were stiff. I only went half way. The second batch was better since I whipped the eggs fully. I also cooked some bacon and the girl were very happy. 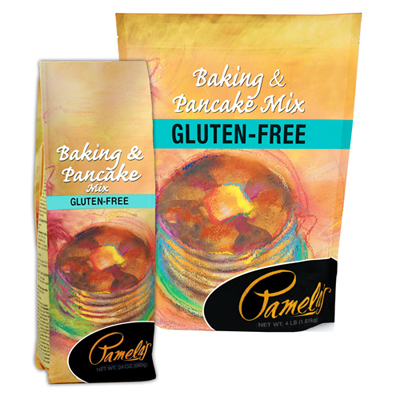 The pancake mix I used. Saturday we played around the house, did some chores, took a walk and got salads to go for dinner. Rory had a Pack basketball game at 5 pm, so it cut right into dinner time. I hung out with the girls and they were pretty feisty that evening. But we had a good time. I put them down to bed, quickly ate my salad and got ready to head out with my girlfriends. We met up at The Depot for some drinks and appetizers. The place was pretty packed, but we snagged a community table and just sat around catching up. It was the perfect way to end my evening. Oh and the Pack won their basketball game, so Rory was very happy. Sunday morning we headed out to breakfast and the girls were still feisty. Luckily, the restaurant was pretty empty since we went so early. After breakfast, we went for a drive and grabbed some coffees to take with us. We just wanted to calm the girls down and have a little peace and quiet. When we got home, the girls were bummed and didn't want to get our of their car seats. They were having too much fun sightseeing. I headed to the grocery store and then came back in time to put the girls down for their naps. While the girls napped, I did some cleaning and Rory did some yard workThe in between the rain showers. My in-laws came over at 4 pm and after catching up, Rory and I headed out for date night. We went to a favorite little place for some drinks and appetizers (hello happy hour!) before heading to an Italian place for dinner. Since we didn't celebrate Valentine's Day or our half year anniversary, we went out on Sunday instead. We finished dinner with dessert, tiramisu, and then a walk to burn off dinner. We headed home to see how the girls' evening went and then went to bed not long after. Food and wine coma. Monday morning I made pancakes (using the same pancake mix above) and lattes since it was raining and had not stopped since the night before. We were in for another rainy day and we didn't feel like going out. Rory built a fire and we played, cleaned and hung out around the house most of the day. Rory did get cabin fever so around 2 pm, we headed out to Petco for some food for Walter and to J Crew to buy the NYC shirt that I mentioned on Friday. The girls had so much fun seeing the animals and fishes in Petco. We bought Walter extra treats (the girls give Walter all his treats) and then headed to J Crew. And I had heard rumors that J Crew was closing soon (possibly moving), so I wanted to see if I could get any deals. And when we arrived, they had already closed suddenly and I was SOL. We headed home and vacuumed since Walter got into the trash while we were gone. Ugh. We did some other cleaning and then played for a bit before making the girls dinner and getting ready for the week. We did baths, laundry and then I made dinner for Rory and I. Homemade pizzas. I love making pizzas at home now. 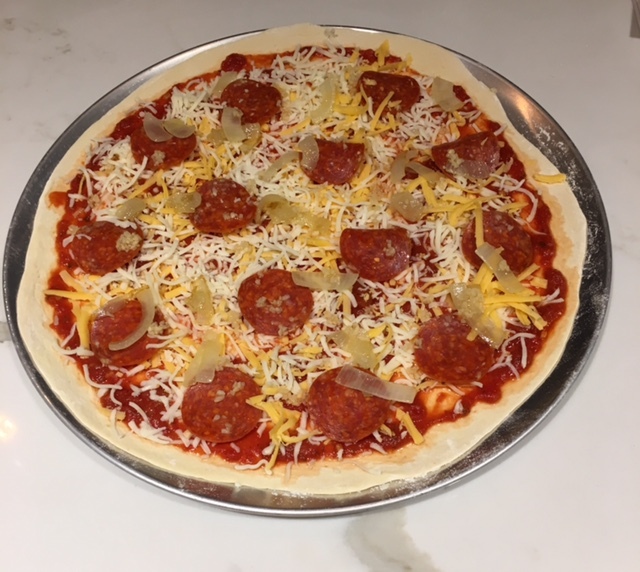 With my new counter tops, it makes it so easy to roll out the dough and assemble the pizzas. We had pizza, wine and watched Parenthood all evening. I even skipped out on The Bachelor for Parenthood. So worth it. I can watch Bachelor tonight. I am so glad it is Friday. Yesterday was just awful. It took everything in me to not punch my co-worker. Thankfully the day passed and I can continue ignoring him and move on. ONE. We are going to check out a new daycare this afternoon. 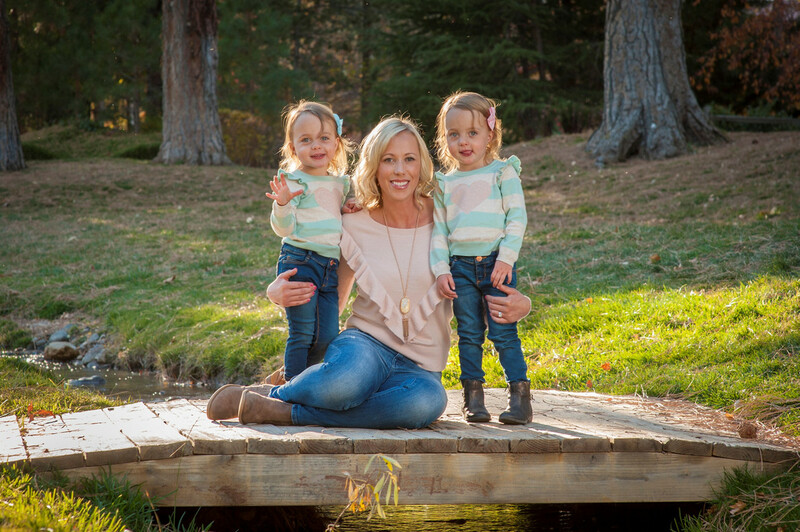 While we love the teachers at the girls' current daycare, we have been having some issues with billing/accounting and the way the front office is being ran. I have done some research and I want to check out this place that is close to my house and is open at the right times. Not only that, but we can work til however late we need to on Fridays, get errands done and not disturb them during nap time. Plus they won't have to do the 45 minute commute each way to work/daycare anymore and that is sure to make them happier and for us to feel safter. If it works out, we will put the girls on the waiting list and wait. They said approximately in August for two toddlers, but let's hope they have openings sooner. I know it will be an adjustment for the girls, but I am hoping with other twins there (3 sets last time I checked), they will settle in easily. TWO. Remember yesterday when I told you about the wines I picked up at Trader Joes? 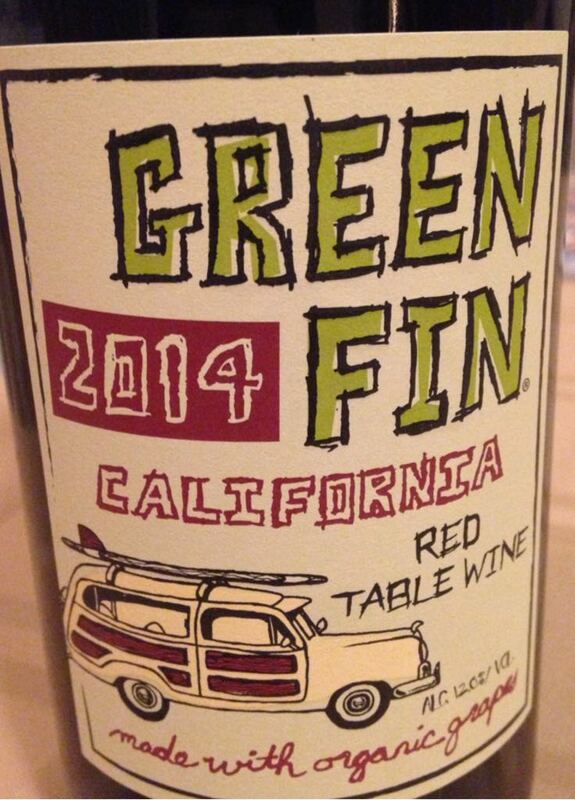 Well we tried Christina's favorite, Green Fin Red Wine and it was pretty good. Definitely worth the $4.49 price tag. It is on the fruity side, so if that isn't your cup of tea, you should pass. But I would definitely buy this one again. THREE. 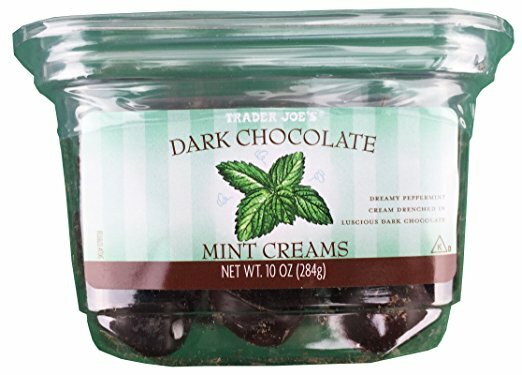 Speaking of TJ's, we picked up our favorite cookies from there, Crispy Crunchy Chocolate Chip Cookies and the best after dinner treats, Dark Chocolate Mint Creams. I never leave Trader Joe's without these two items. Never. And we usually finish the entire container of cookies in three sittings. The cookies are tiny, crispy with little bits of coconut in them. 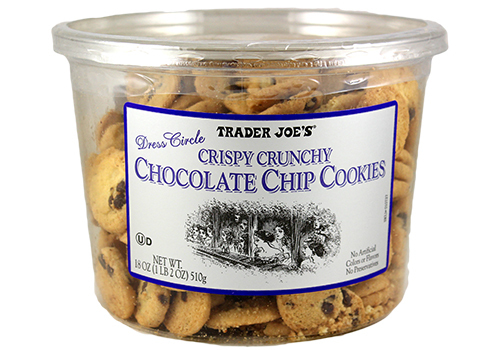 Seriously, they are the best cookie. And you can eat 12 of them and not feel guilty (12 cookies per serving, 150 calories). The mint creams are like peppermint patties, but the center is really creamy. FOUR. As we all know, I have been shopping around for some Spring/Summer clothes and it hasn't been the easiest since not many stores have their lines out yet. 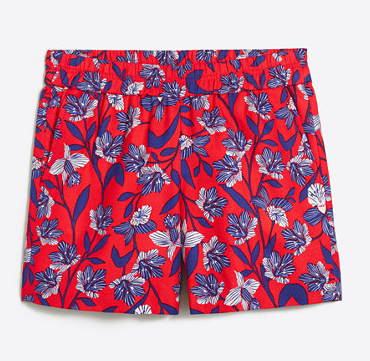 But I have found a few things at J Crew that should be arriving at my house very soon. I also have some Gap cash waiting to be spent starting Tuesday, so I should be able to scoop up more then. Here is what I have purchased recently. Seriously, how cute is this shirt?! 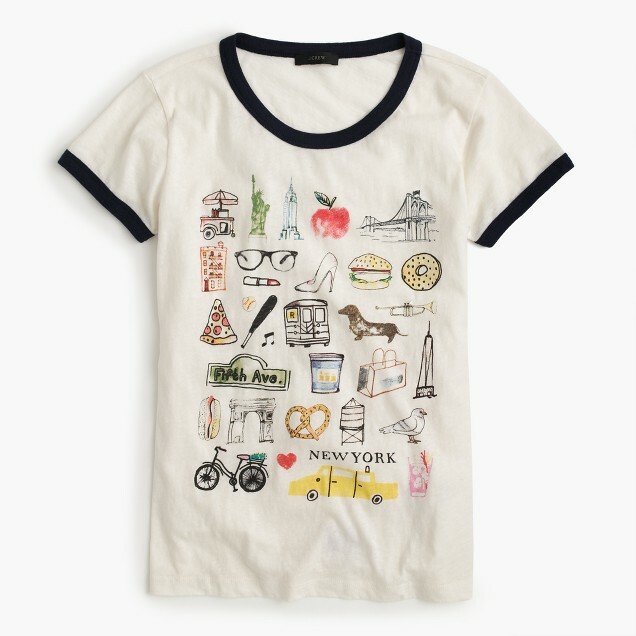 I love NYC and this shirt encompasses some of my favorite things EVER! I also bought some basic colors like black and chambray. FIVE. I forgot my phone at home yesterday and it was liberating and awful all at the same time. I worried that I would get a call from daycare and not know it or miss another important phone call. But it was nice not to be attached to it. I thought going to the gym would be torture without it (since I watch Netflix on it or listen to music), but I just ran and stared at the wall. Ha. It was nice to just think and let things go. Especially after the morning I had. It's funny how attached we get to our phones. They are our lifelines and we feel so naked without them. But I survived and nothing crazy happened, so I didn't miss much other than the IG stories that I love to watch throughout the day. It's confession time and I have a lot to get off of my chest. So grab the button, confess your heart out and come back to link up. / that I bought a bunch of cheap red wines at Trader Joes yesterday. Last week Christina, from Carolina Charm posted the picture below and stated that these were her favorite red wines from TJ's and they were cheap and super good. She said she put the best on the left. So what's a girl to do while in TJ's with her husband and kids? Buy them all. And so I did. I can't wait to try them out. / that the only thing I received for Valentine's Day was a beautiful Glassy Baby from my in-laws. Not even a card from my husband. Boo. I know we weren't celebrating Valentine's Day technically and wanted to celebrate our half year anniversary, but a card would have been nice. I got him a card, wrote a sweet IG post and got some candy. / that our half year anniversary dinner isn't going to work out. Boo, again. We don't have anyone to watch the girls Friday and so we were going to do it Saturday night, but Rory has a Nevada basketball game to go to. Ugh. When will this season be over? / that I can't wait for baseball. I want to watch my Giants and maybe even go to a live game. Gasp. It has been far too long and this fan needs to see her team. Birthday present maybe? / that I am in a bit of a funk lately. I think it has to do with this crap weather. We have about one day of sunshine every two weeks and it is just blah. I usually am over winter by end of March, but right now, I am over it. I do want to snowboard more, but I want sunshine down in the valley. And warm temperatures please. Is that too much to ask? / that I ate a whole bag of Airhead bites, the family size yesterday and it was so good that I contemplated getting another bag for today. But that means more running. Blah. / that work has been stressful this week and I am looking forward to the weekend. I need a little break from one of my applicants. / that I could eat pizza everyday. It is a food I never get tired of and I dream about it. / that I can't get enough of Parenthood. We have been skipping our shows to watch it nightly. I did take a break so I could watch the Bachelor (wasn't worth it), but Parenthood is just soooooo good. / that I am not happy about the new Bachelorette. Why can't they branch out and chose someone new? I want to get to know the person through the season and not know them already. Ugh. Bachelor/Bachelorette bring in some new people please. I like the fact that they went the direction they did (don't want to spoil it if you haven't heard), but I would rather see someone new. Ok enough complaining/venting/talking. What are your confessions? A couple weeks back three of my blogging buddies announced a link up that I couldn't wait to participate in. It's Remembering the Little Things. 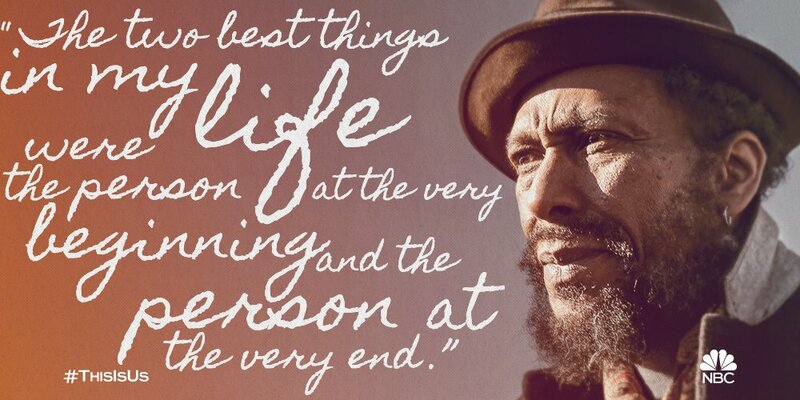 We often get so busy in our day to day lives that we forget the little things. These are things that one day we will miss and often take for granted. 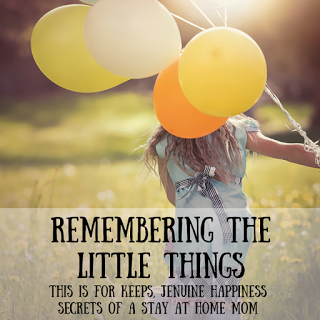 These are just a few of the little things I want to remember. - Sunday, Sutton was sitting on my lap and wanted to give me kisses. She would lean in, look at me, giggle and give me a little kiss. Sometimes she played and would go in to give me a kiss but would back out and laugh. She thought it was so funny that she did this over and over. It was really sweet and something that I cherish. - When the only thing that will calm my girls down is them brushing my hair. - Avery will randomly just say run, run, run, and she will run circles around the coffee table giggling. - When the girls reach out and say hand because they want me to hold their hand. - Avery will call out "my paci" over and over again in the middle of the night when she wakes and can't find her paci. - Everyday when we pick the girls up from daycare, they run up to us for the biggest hugs and then grab our hands to go get their lunchboxes, before waving to their teachers and saying bye!! - Seeing my girls experience being in the snow for the first time. - Hearing my girls say "I lub you". I LOVE YOU AVERY AND SUTTON! While we don't have much on the agenda today (boo to Valentine's Day being on a workday), I still wanted to send out all the loves and hugs today. I will be taking a break from the kitchen today and we are having either Thai takeout or pizza. Something simple and easy. That way we can enjoy the evening together and not worry about the hustle and bustle of the day. I don't remember if I told you all, but my only New Year's resolution was to be more adventurous with cooking. I want to try new recipes that may be outside of my comfort zone or a new take on a food that I like. I have mentioned my Cravings Cookbook about a thousand times now. I continue to cook my way through it and I always want to let you all know what has worked and what hasn't worked for us. 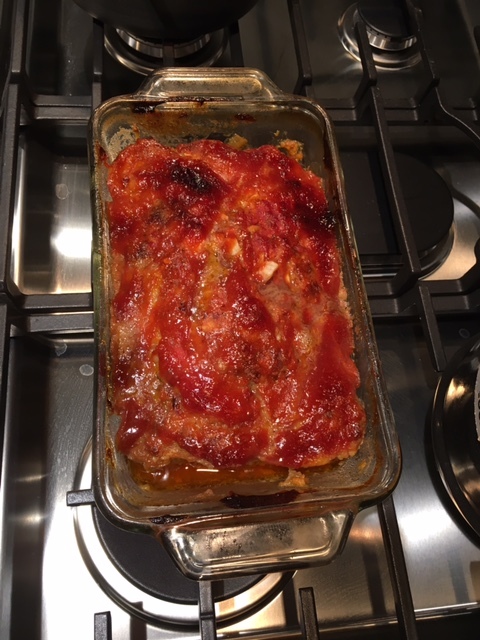 Monday evening, I decided to tackle Chrissy's Spicy Italian Sausage Meatloaf. Now let me preface this by saying that my mom passed down her meatloaf recipe to me and I have been making it for YEARS. I love her recipe and there are only a few meatloafs that I have liked other than my moms. One is from a local bbq place that uses rice, carrots and other goodness in theirs. It has a spicy bbq sauce on it as well. Seriously so good. That is why this recipe called out to me. I loved the idea of adding spicy Italian sausage to the mix and having a ketchup and brown sugar glaze on top. The recipe says it takes a total time of an hour and a half. I knew that if I started it right when I got home from work, I would be done by 7 pm. Easy enough. What I didn't account for was that I was missing the ground beef, that my food processor broke a few months back and all of the chopping it entailed. I got everything chopped, measured out and mixed together. I put it in the oven at 350 degrees and waited an hour, per the instructions. The recipe also stated it would be done when the glaze had a slight crust to it. When I checked it at an hour, it wasn't close to being done. It took an additional 20 minutes to cook. And I was already behind from all the extra chopping, well mincing I did. Not too bad. They looked similar. Now onto tasting it. Our verdict: This is the first and last time we will make it. Whomp, whomp. The first couple bites were good, but then it became too sweet. I am not sure if it was the carrots, the sausage or the glaze on top, but we didn't even finish our portions. I think the sausage added a weird texture to it and I would have just preferred the ground beef in it. Also, I would recommend using tomato sauce instead of ketchup on the glaze. It just didn't taste right. But at least I broke out of my favorite meatloaf comfort zone and tried a new recipe. 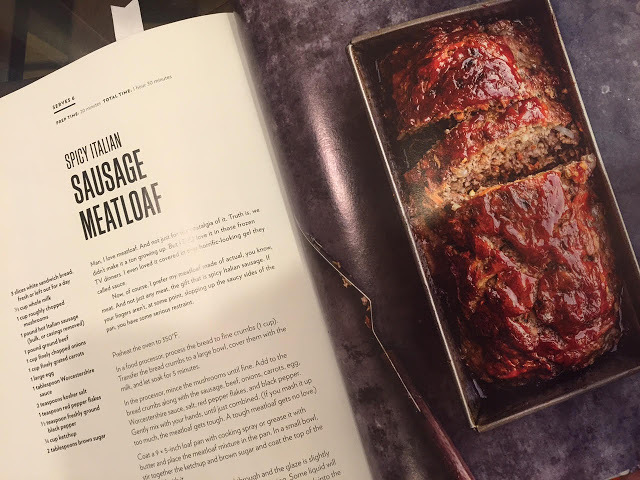 Have you tried her meatloaf recipe? Do you even like meatloaf? I am so not ready to be back at work and into another week. 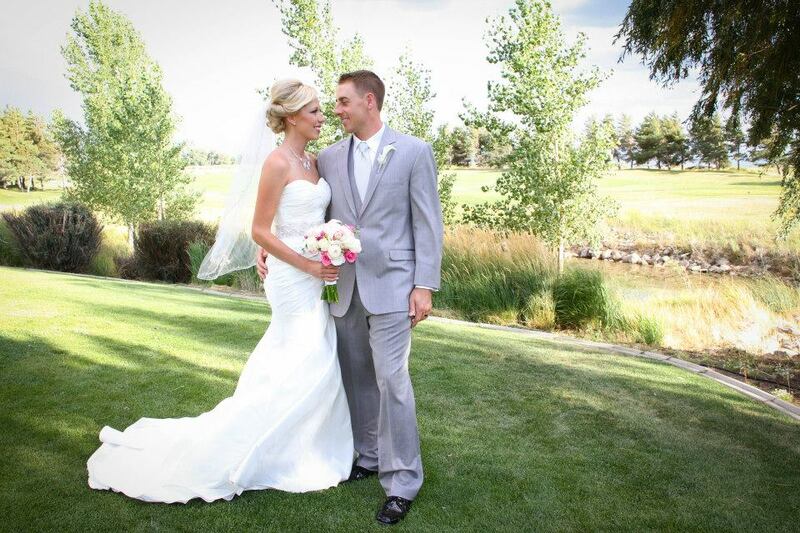 We had a great weekend and I didn't want it to end. Friday after worked I treated myself to a pedicure and it felt soooo good. I now have teal sparkly toes and the softest feet. After my pedi, I headed to Target for Valentine's. Nothing like last minute. I picked up a bunch of other stuff along the way. Then I had to go to Costco for wine, diapers and wipes. I made it home just in time to feed the girls dinner and then we headed out for the evening. My parents came up to watch the girls and they played all evening. Rory and I headed to our favorite pizza place (Italian style thin crust pizzas) and then to a beer bar to meet up with co-workers and his softball team. I had two beers. One was from Toolbox Brewing (Bog Sauce - sour with raspberry and cranberry) and a local beer that was on nitro. So good. After having beers, we stopped at the Baked Bear on the way home for ice cream sandwiches. I had a white chocolate macadamia nut cookie with coffee ice cream. It was the perfect combo. We got home and relieved my parents of babysitting duty and went to bed right after since we were going snowboarding in the morning! We got up bright and early and got the girls ready for the day. Then we headed off to the mountain. Mt. Rose had been closed all week except Friday due to high winds, so we were in for a treat of fresh powder. Especially on one side that didn't open the previous day. But that meant massive crowds. We were at least 30 chairs deep in line, but I went on a black diamond run that had barely been touched and had fresh lines the entire way down! I took it very easy that day since surgery had only been 5 weeks prior. I got in 9 runs in 2 1/2 hours which is pretty good with how busy it was there. The visibility was getting worse and worse, so we left around 11:30. We grabbed some In N Out on the way home and got home in time to shower and relax a bit before the girls got up. We took the girls on a walk since it was mostly sunny and in the 50s. We did our usual evening routine and then I headed out to dinner with my friend. We went to sushi and it was packed. It was almost a 40 minute wait. Ugh. And I was starving. But we got our sushi fill and then went to a local bar where my friend sang karaoke. I just watched and went home at 10 pm because I was exhausted from the day. Sunday morning the girls didn't let us sleep in much which was a bummer because I was sore and tired from the day before. But we went to breakfast and had the most delicious apple cinnamon french toast. After breakfast, I headed out to go grocery shopping. I stopped and got lattes on the way home and then I dusted and vacuumed while the ate lunch. Soon after, we put the girls down for a nap and I sat down to work on their Valentine's for their party on Tuesday. I had to address the cards and put together Frozen 3D puzzles (not fun) and then added a piece of candy to each card. I also put together cards and a little gift for their three teachers. After nap, we caught part of the Nevada basketball game and then headed out to a local museum that had a Toy-apuluza event. They had the giant piano like the one in the movie Big, giant light brite, a life size doll house, old arcade games, lincoln logs, puzzles, Monopoly game boards, Mr. Potato Heads, trains, Lego's and so much more. Another twin mom told me about it and since the girls were free, we thought why not. The girls had a blast and so did mommy and daddy. We got to play with a bunch of old games and see how kids do the same. The girls LOVED the piano! After the museum, we walked around outside since it was 55 degrees and let the girls burn off more energy. Once we got home, we took Walter for a walk and the girls rode in the wagon. It got cold fast as the sun was going down, so we booked it home to make dinner for the girls and start their evening routine. I also started dinner for Rory and I, spaghetti. We gave the girls their baths, did laundry and got everything ready for the week ahead. Once the girls were down, we started Parenthood and had dinner with a glass of wine. It was the perfect way to cap off an amazing weekend! And just like that it is Friday. I had a pretty busy work week, so this week was pretty nice to me. I still have a slight cough and sore throat, but hoping it won't hinder my weekend plans. We have had storms all week, so I am hoping for a little snowboarding action Saturday morning. It will be my first time in over 5 weeks. Wish me luck and please don't say break a leg because that could happen. Ha. Let's dive into my Friday Favorites and Happenings. ONE. Thank you so much to everyone who linked up with Lizzie, Lindsay, Sierra, Emily and I yesterday. I think we had a great turnout and I can't wait for the following months. I loved reading everyone's Valentine's Day plans or lack thereof. Again, thank you! TWO. I have had my car for three years (next month) and it is time for new tires. Or close to. Boo. I always dread getting new tires because it costs a fortune. Though this is my first set on my Subaru and they weren't too crazy priced. Now when I had my Toyota Tacoma, those babies were pricey. 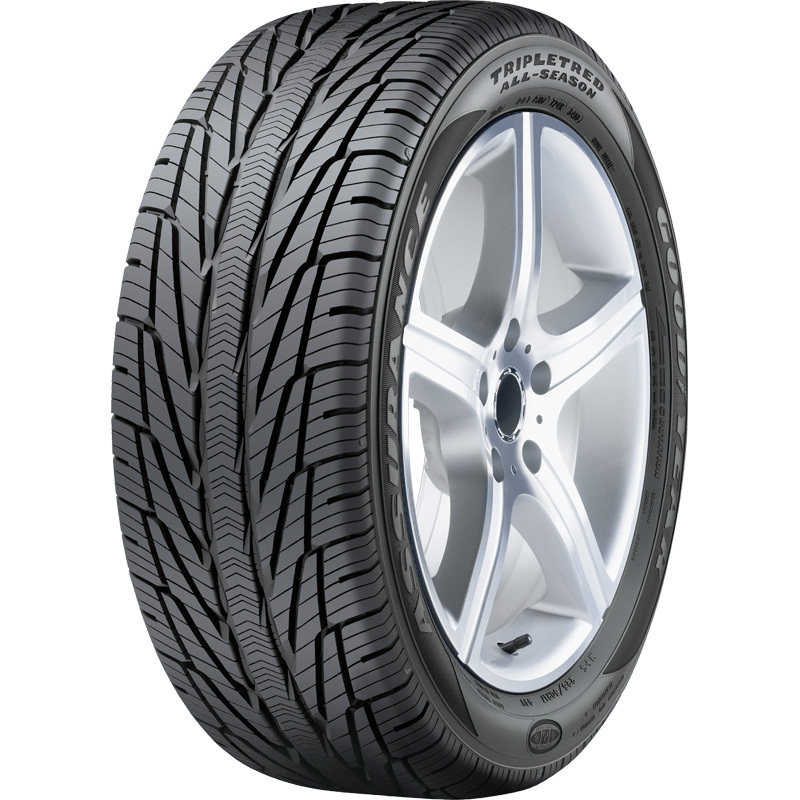 I have an awesome co-worker who loves cars and he recommended the Goodyear Assurance Tripletred AS tires if you have a Subaru and drive in the snow a lot (hello Nevada). He said they have the stickiest grip and are amazing. My other co-worker has had them for awhile and LOVES them. Yep he loves tires. So I guess I am shelling out $700 soon. Ouch and right before Mexico and tax season. Oh you get refunds each year? We paid the last two years. Boo. And I am waiting until the last second to do my taxes this year. But if you want awesome tires, check these out. THREE. 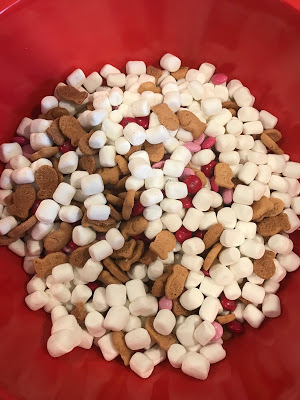 Yesterday Emily (from Three Boys and A Girl) shared this awesome Valentine's snack recipe. It has Valentine's mini m&ms, mini marshmallows and vanilla cupcake Gold Fish grahams. It looks super easy to make and sounds really good. I mean, I have never heard of vanilla cupcake grahams, but I need to find these asap. I plan to make this for the girls Valentine's Day party next week. I think it would be cute to put in little baggies for the girls to share with all their classmates. Plus I need to find them some Valentine's. Nothing like last minute. Though I didn't get the memo on the party or the details as the girls were out sick all last week when they sent home stuff on it. I just found out yesterday. But seriously, head over to Emily's blog and make this. FOUR. Yesterday I was looking through my daily deal emails and I found the cutest sandals. I instantly bought a pair in black before I could change my mind. If you are looking for cute sandals for the Spring and Summer, snag yourself a pair of these. They are only $19.99. FIVE. 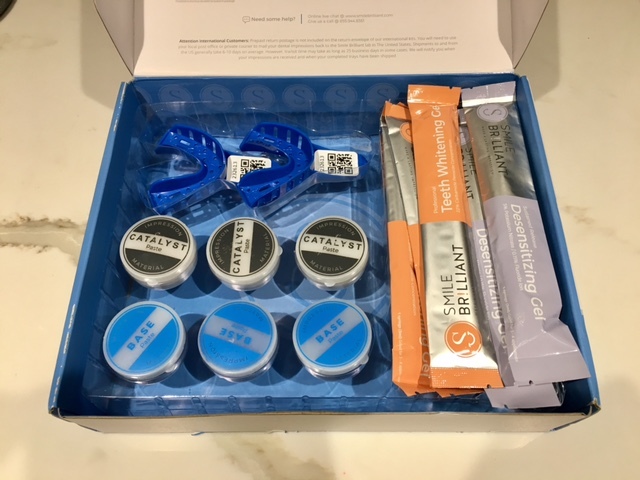 Don't forget to enter the giveaway for your own Teeth Whitening Kit from Smile Brilliant. Enter here. 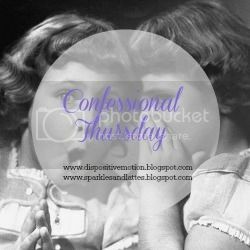 In case you missed it, no confessions today. Instead, today is the first Girl Chat link up. 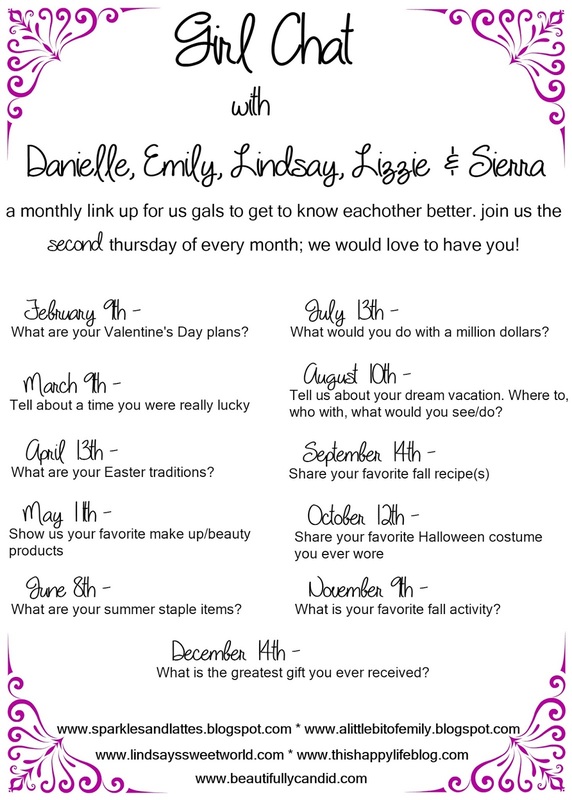 This month's topic is What are your Valentine's Day plans? Awe yes, Valentine's Day. The day of Love. The day of expensive dinners, candies, flowers and chocolates. So what will the Butler's do for Valentine's Day? Well not much. Before kids, we loved going to a special dinner and showering each other with gifts. But with budgets, kids and finding babysitters, it gets harder and harder. And since Valentine's Day is on a Tuesday this year, we will be ordering in take out from our favorite Thai place and cuddling up to a couple episodes of Parenthood. It may be boring, but it is our life and I love it. Instead of the big Valentine's Day, we have decided to do a half year anniversary dinner. Our anniversary is on August 17th, so we thought we would celebrate 3 1/2 years of marriage with dinner out on February 17th which happens to be a Friday. I love this idea because I believe you should celebrate your love and your spouse EVERYDAY rather than a single day of the year. And it is a little change up. We will be "using" our monthly date night and having family watch the girls. We have dinner reservations at one of our favorite local restaurants and then we will walk a short distance to a favorite bar for some after dinner drinks. We will get dressed up, have adult conversation and get back to the roots of where it all started. As Danielle and Rory. I can't wait for our little change up to Valentine's Day. We agreed no gifts this year with our Mexico trip coming up in 36 days. Are you going traditional or changing it up for Valentine's Day? What are your Valentine's Day plans?